No internet connection in Windows, however internet is accessible on the Mac side. Internet connection is low or unstable. Issues with network dependent software even though the internet in Windows is working fine. Other home network computers are not reachable. Network settings misconfiguration in Windows. 3rd party applications or antivirus software are blocking network connection. Make sure your Mac is connected to the internet, Windows will not be able to access the internet if it's disconnected or inaccessible on the Mac side. Before going any further please take a snapshot (Actions > Take Snapshot) to be able to revert back to a pre-troubleshooting point. Perform clean boot in Windows by disabling 3rd party applications' services including 3rd party antivirus software which may have a negative impact on a network driver's installation. 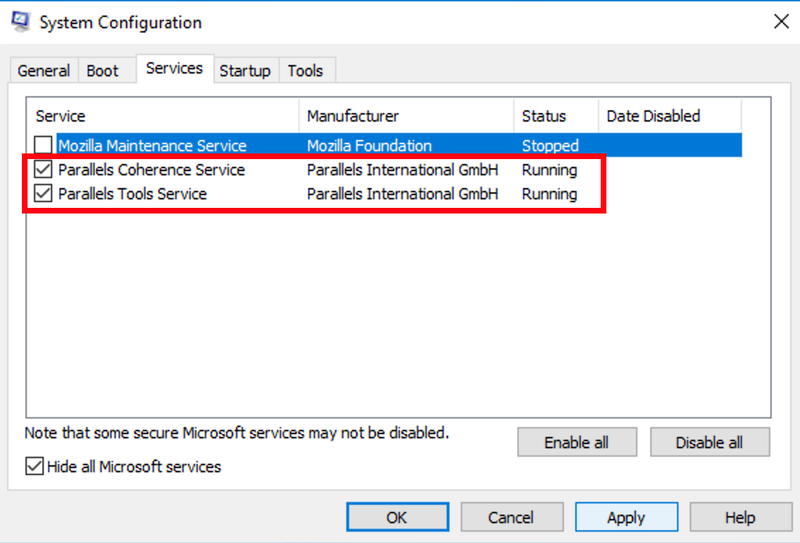 NOTE: in step 3 keep both Parallels Tools services enabled. Go to the virtual machine's configuration > Hardware > Source > Shared Network (Recommended) option should be set by default. 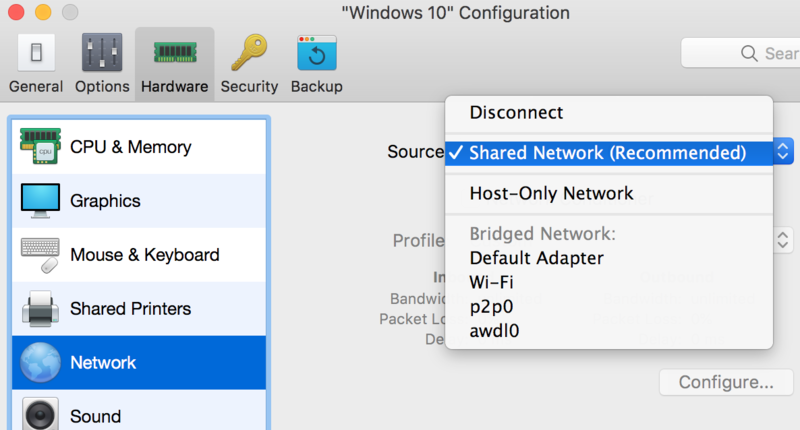 If you have already got Shared network set but still experience network issues in Windows switch it to Bridged Network: Default Adapter and verify if the internet is working in any of these modes. If this helped and internet connection restored, enable all services back one-by-one to identify the problematic 3rd party application. If internet is accessible in one of the modes - either Shared or Bridged but having a different connection type set doesn't suit your needs, proceed to additional troubleshooting. Open Command Prompt in Windows by clicking on Start menu and typing in cmd in Search field, then hit Enter. Then close Command Prompt window and restart Windows. If setting neither Shared nor Bridged type or releasing and renewing IP address helped and there is still no internet connection in Windows. Open Device Manager in Windows by clicking on Start menu and typing in devmgmt in Search field, then hit Enter. If you see any other name (e.g. Ethernet Controller) or the adapter has an exclamation mark > right click it > choose Uninstall device, then install Parallels Tools again (Actions > Reinstall Parallels Tools). If none of the above helped, scan your system for integrity violations. 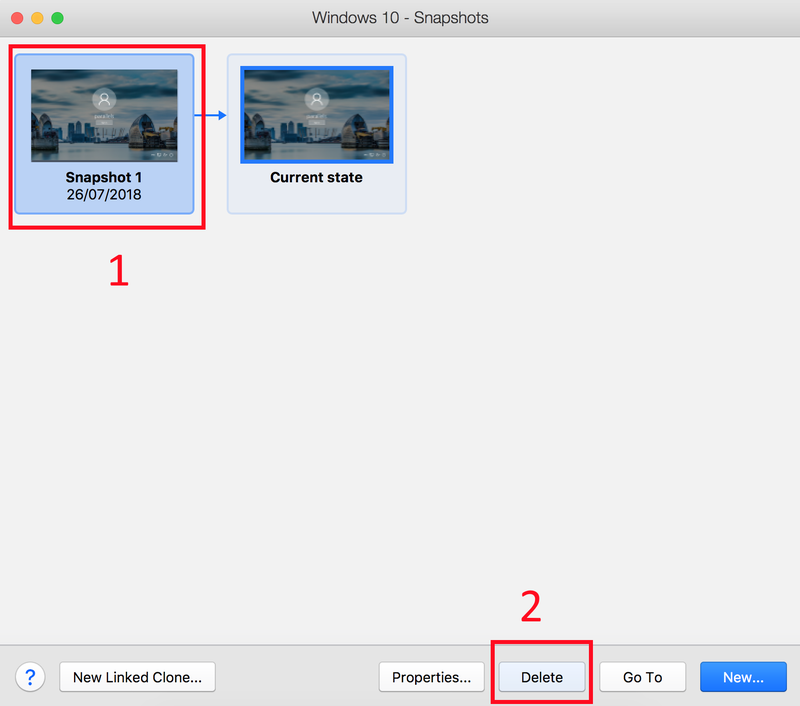 When the issue is resolved remove the snapshot taken in step 2 by going to Actions > Manage Snapshots > choosing the snapshot > pressing Delete > Yes. If you have Parallels Desktop for Mac Pro or Business edition you can reset preset network settings for the whole Parallels Desktop application by going to > Preferences > Network > Restore Defaults.